The information display, speedometer and tachometer can be checked in self-diagnosis mode. Check combination meter power supply and ground circuits if self-diagnosis mode does not start. Refer to MWI-52, "COMBINATION METER : Diagnosis Procedure". Replace combination meter if power supply and ground circuits are found to be normal and self-diagnosis mode does not start. Refer to MWI-77, "Removal and Installation". Combination meter self-diagnosis mode will function with the ignition switch in ON. 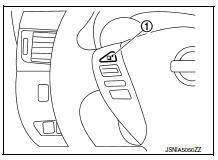 Combination meter selfdiagnosis mode will exit upon turning the ignition switch to OFF. While pressing the steering switch 1 , turn ignition switch ON. Make sure that the trip meter displays вЂњ0000.0вЂќ. The combination meter is turned to self-diagnosis mode. 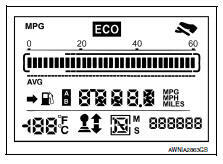 Speedometer, tachometer, engine coolant temperature gauge, fuel gauge, and return to zero, simultaneously. All segments of the information display are displayed. 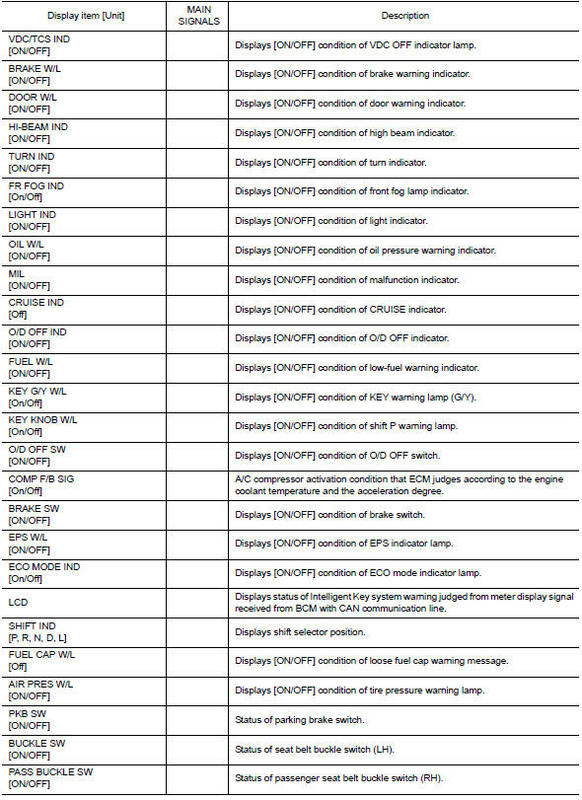 Check the following items when the self-diagnosis mode of the combination meter does not start. Replace combination meter if the following items are normal. Combination meter power supply and ground circuit. Steering switch signal circuit and steering switch. If any of the dots are not displayed, replace combination meter. Each meter activates by pressing the steering switch . If any of the meters or gauges is not activated, replace combination meter.